Cross country skiing in Park City is one of the true gems of winter. There are peaceful, beautiful trails for every level of skier. Skiing provides a great workout and is lots of fun, but there are a few important things to keep in mind before you head out on to the trail for the first time. 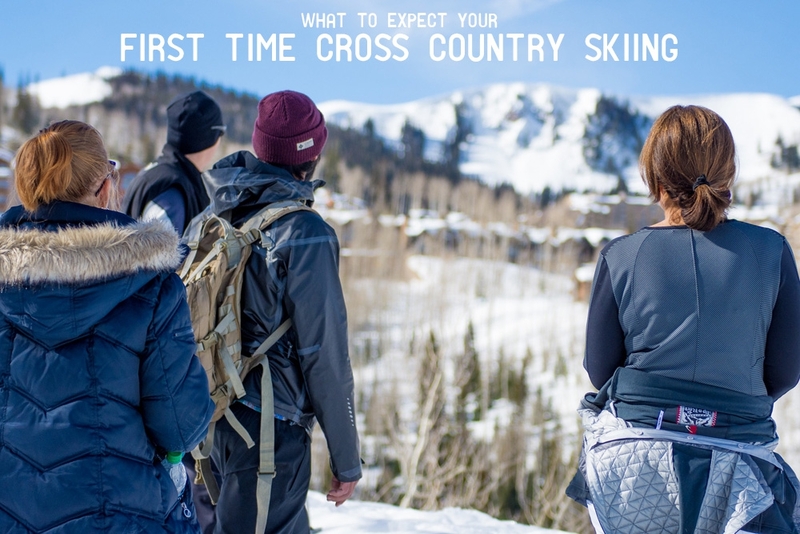 What to bring, what to wear and who to go with can all make or break your first time cross-country skiing (sometimes called classic skiing). Here are a few tips on how to get you swishing down the trail on just the right track. The gear for cross-country skiing is fairly straightforward but can take a little getting used to. Skis: You will want to use a set of touring skis which are narrow and lightweight. These are designed for groomed trails, called tracks. Skis are usually waxless because they have a textured pattern on each ski that digs into the snow providing traction. However, even waxless skis tend to perform better when wax is applied to the tips and the tails. Boots: Boots will connect to your skis at the toe, leaving the heel free for gliding and maneuvering. A ski boot should be comfortable but provide a certain amount of flexibility for turning and stopping. Poles: Poles should be strong and lightweight. They measure from the ground to your armpits. Try to find a pole with a cork handle as that will be more resistant to cold than a plastic, which will leave your hands warmer. Most poles will also have straps that cradle the back of your hand, allowing you to get more leverage. The correct clothing is very important to cross-country skiing. In our experience, most first time cross country skiers overdress and end up getting sweaty, which then leads to being cold. Try to wear breathable, stretchy layers. As this is an aerobic activity, you will get hot but you want to be protected from the outdoor elements. Bring or wear an insulating layer and have a light waterproof layer with you. Start with a hat and gloves and take them off if not needed. Sunglasses are also highly recommended. Many people like to use a small back pack or a lumbar pack. These items can be useful to stash extra layers as well as a water bottle and some small snacks. It is surprising how much energy one burns when exercising outdoors in cold temperatures. A granola bar, energy gel or block can come in handy. It’s also a good idea to carry extra sun screen, lip balm and eyewear even in cloudy conditions. 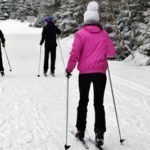 Whether you’re going on a day-date or it’s a whole family affair, for your first-time cross-country skiing, it might be best to go with a professional guide. A guide can help you select the best gear for your interest and abilities. They can also assist with choosing the best wax for the days conditions. Guides know the trails and are at the ready to provide the tips and insider knowledge that will ensure that your first experience is a wonderful one. Though cross-country skiing has little to no impact on the joints, it does have a big impact on your muscles. Make sure and drink plenty of water post-ski as it is very important to re-hydrate. Also, stretch as much as possible. 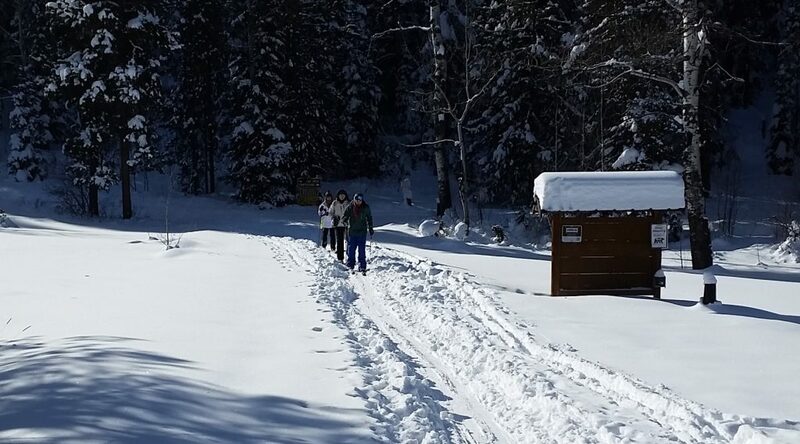 Cross country skiing engages the core muscles, the hamstrings, quadriceps, gluteus and leg abductors/adductors. The more of these muscles you can stretch, the less likely you are to feel soreness the next day. Follow these tips and your first day of cross-country skiing will be a wonderful and memorable one…hopefully the first of many! 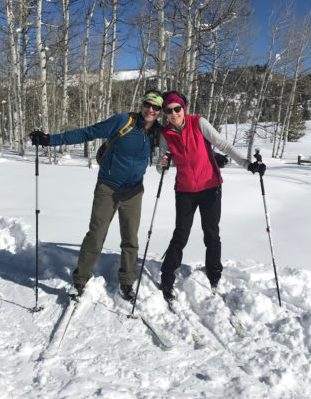 If you live in Northern Utah or are taking a trip to Park City this winter, check out All Seasons Adventures’ guided cross country ski service. The price (starts at $99 per person and go down based on group size) can’t be beat when you consider that gear, snacks, transportation and your very own local guide are included. Learn more. My wife is super into skiing and we are thinking about using a ski tour service so that we can ski more. I have always wanted to do cross country skiing. It seems like it would be so much fun to ski down the entire mountain.